Dakar Rally winner Nasser Al-Attiyah is bent on breaking stereotypes. The star of both shooting and rally car driving internationally, he has defied the idea that specialisation in a single sport leads to success. Rather, he believes that multiple sports can teach an athlete valuable crossover skills. 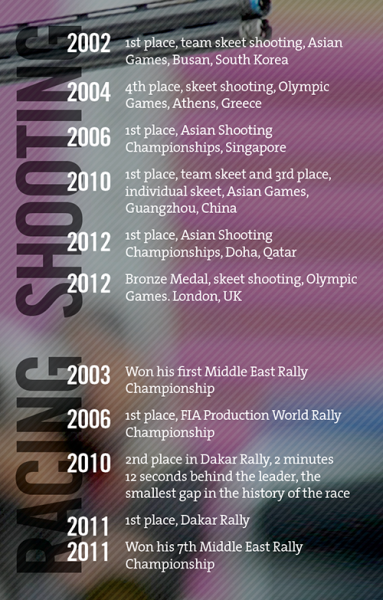 Following a Bronze Medal at the London 2012 Olympics, his results in world-class rally driving and shooting make him not only one of the most successful competitors in his respective sports but one of the most unique athletes in the world. A source of pride for the Arab region, he is an advocate for the importance of not just physical but mental fitness as well. In an interview with Dr Nebojsa Popovic the 41-year-old Qatari athlete speaks of the importance of respect, concentration and a winning mentality. What are the main skills of a professional rally driver? When I was young, my ambition was to be like the world champion drivers from Finland such as Ari Vatanen or Juha Kankkunen. I was lucky to get the chance to be a rally driver, but it wasn’t easy. You must work very hard and learn to respect the people who work with you. You must also work with the right people and know every detail about the sport so you can feel it from inside. You must respect time because time teaches us many things. You must excel at your chosen sport and build your skills through training but to be the best, you must also be clever and choose a good path to achieve success. I combined all of these things to become a professional rally driver. To be a successful rally driver, what percentage would you say is talent and what percentage is hard work? You need to be talented but, in my opinion, it’s not just about talent. You also need to work very hard. And not just physically – you have to learn to use your mind and be cleverer than the other guy. I would say that you need 40% talent and 60% work. Personally, I can get away with a little bit less of the hard work because I have a talent for noticing and then mimicking the skills I need for my sports. Of course, sometimes imitating is not enough – you must challenge yourself to improve. How important is a team to you? My team is very important because without the support of a good team, it is a hard road to success. It is very important to choose the right people to be part of your team. You need people who have good team spirit and who will support your mission. When you are competing in the Dakar Rally, who is your team made up of? My team is made up of my co-driver, mechanic and the engineer who knows everything about me. He knows what time I should drink, when I should sleep and what food I should eat. He can read me like a book and knows exactly what I need without me telling him. He is the director of the team and I really trust him. He does a lot of the organisation and everybody goes to him if they have things to discuss and decisions to make. Then he comes to me and presents me with the propositions. Could you tell us about your medical team and their role? Every Dakar, we contract a doctor and physiotherapist from the Dakar Rally organisation. We use the organisation because it is easier for us with regards to visas and transport. 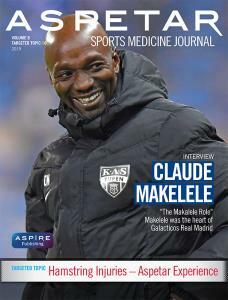 However, next year I really want to build a medical team from within Qatar. Why is your medical team important when you race? My medical team is very important because the conditions can be physically very difficult. The Dakar race is 12,000 km and 15 days long which means I drive 14 hours a day for 15 days without stopping. In the car it is 50 to 60°C, depending on the altitude. To give you an idea of how this can affect the body: in 2004 I completed the Dakar Rally for the first time. My weight was 71 kg at the start and when I finished the race I had lost 8 kg. It can really cause your body problems and make you feel very weak. When you lose 7 to 9 kg in 15 days, most of which is liquid from your body, it can be quite dangerous. Do you eat while you drive? Yes, we eat. We eat special dried foods like dried fruit and I love dried meat. This keeps my body healthy. I drink 12 litres of liquid every day. I don’t just drink water because too much water is not healthy in these situations. Sometimes you need the salt and sugar that you get from other liquids. Do you drive the whole race yourself or does your co-driver do some driving? No, I drive all of the time. My co-driver focuses on reading the map. How do you maintain concentration for so long every day? Concentration is very important, because you drive at your maximum potential from start to finish. If you lose concentration, mistakes can happen. We try to be smart about this. Sometimes when I feel I am losing concentration, I reduce my speed. Often this can be related to fatigue, so to build my concentration back up I have something to eat or drink. After about 15 to 20 minutes I feel my body recover and I can return to the same driving pace. This is what we always try to do. Having my co-driver is really helpful. We do a lot of fitness training to prepare ourselves to be mentally ‘strong’ inside the car. What are your sleeping patterns like at the end of each stage? We normally finish driving for the day in the afternoon and the first thing I do is get a massage. Afterwards we get a check-up from the team doctor to monitor our health and hydration. We then have our dinner followed by a debrief with the team and after that, I try to sleep for 6 to 7 hours. What do you find the most difficult about the 15-day Dakar Rally? The challenge! I see many drivers retire because they do not have enough strength and stamina for the race. Maybe they’re not well prepared before the event or maybe they are not mentally strong – it depends on the person. But we see it happen a lot and try to avoid it ourselves by enjoying the race and having fun by meeting people etc. We try to create this feeling quickly so that after 4 or 5 days, the race feels like it is part of our normal routine. In a race like the Dakar Rally, where you’re driving and concentrating for 10 to 15 hours a day, how does time feel for you? Does 1 hour feel like 5 minutes or vice versa? Time can certainly escape you. I remember in 2011 when I won the Dakar Rally, I was racing against another driver. During the race I forgot to eat and drink because I was concentrating so hard. We were very focussed and we were fighting for first place. I didn’t eat or drink anything. I won the stage and didn’t feel fatigued but I couldn’t understand why I still had 12 litres of drink left. I remember worrying that the doctor would be disappointed because he insists that we always eat and drink to keep our body healthy. Recovering after a race like that takes time so if your body suffers one day, it may not recover in time for the next. With this in mind, how do you mentally prepare for each daily stage? In both the big and small stages we always treat it like a big day. If you are constantly thinking about how many kilometres to go until you finish or how many hours have passed, you will always be focussed on time and distance and not concentrating on the driving. So from the start to the finish of a race I never ask my co-driver how far we have driven or what the time is because if we start that conversation, it will not be good for me, mentally. I just keep the pace from start to finish and focus. Earlier you mentioned that you have always admired drivers from Scandinavia. Being from the Middle East, in what way did you relate to them? Even though we are from different cultures, we have the same mentality which is the mentality of winning. We want to win the race and to achieve our goal. Personally, I try to mix the European mentality with a Middle Eastern mentality to achieve success. In your opinion what qualities do you have as a Middle Eastern driver that, say, European drivers do not have? like the United States and against the millions of people who live there. In Qatar, we have a tradition of people driving in the desert and in the sand which is not easy. Even children get used to desert driving at a young age. That is something that they don’t have in Europe and it means that we have a good selection of drivers. However, this culture of driving can also lead to problems such as people driving irresponsibly or without a license. This is something we are always trying to change and we are trying to teach people the right way to approach cars and driving. I have the impression that people from the Middle East have no fear when they drive. Do you agree? It is true but it’s not necessarily a good thing. Sometimes people drive without thinking and they don’t respect the rules. Often those who respect the rules do it because they are afraid to break them. However, in Qatar there is no fear and so no respect of road rules. When I drive in my home country I wear a seatbelt and I keep my children in the back with a child safety car seat. When people see me, they ask me why I do this. They see what I do as different because I respect the rules and I am afraid. Of course I am afraid – why would I put my kids in the front? If I hit the brakes they will smash through the front windscreen! Do you ever feel afraid during competition? Of course. If you don’t have any fear, you don’t win. You need to push hard without taking too many risks. Like when you go to the casino. It is a risk. When you go with 100, you should plan to play with 100, not to gamble with 1 million. You must be afraid in your life, because if you are not afraid, you will make a lot of mistakes. Have you ever had a car accident? Yes, in 2005 at the Paris-Dakar rally. I crashed and the car rolled a few times. I was lucky not to have any major injuries, but because it was a bad crash my co-driver fractured three of his ribs. I made the decision to abandon the race after that. What conclusions did you take away from that accident? I gained a greater appreciation for the protective suits, helmets, cervical spine protection and seat belts that are used to help to protect us in these situations. Without them, the consequences could have been grave. That is why rally drivers are respectful of all the safety advice we are given and we try to follow that advice completely. You are not only a driver, you are also the leader of your team. That is a high demand for one athlete. Yes, this is a good point. I am the owner of the team and I have to find sponsors, but when I drive, I am only the driver. I respect the people in my team. When I am competing I don’t have time to think about other things, otherwise I will lose my concentration in the race. I am there for 15 days only to drive and each person in my team has to do their job. When I finish the stage, we have a long briefing, we talk and I return to my position as the leader to analyse the race so we can hopefully continue again the next day with an even better performance. Tell us about your second passion, shooting. What are the qualities of a good athlete in shooting? You need to be a good quality athlete, physically. Secondly, you need to be mentality fit. You also need to respect your coach and the programme he prepares. I think this is one of the reasons why I have had good results and success in my shooting. The biggest mistake you can make is starting to think that you don’t need a coach. I have seen young shooters who win a medal at an event and think that they are already a big champion. From then on they stop listening to their coach. This is wrong – you must always respect your coach and your team. My coach makes the plan and I follow it. If something is wrong then we try to fix it together. Another thing you need is experience. I have now been shooting competitively for 20 years and I know everything about the sport, but still I accept that my coach is the leader and I am the shooter and this is why we have a good relationship. Many times my coach has said to me, “Nasser, I cannot teach you anymore because you are a great shooter,” but I recognise that there is still a place for a coach to advise and assist. There is always a role for the coach. You have achieved success on the world stage in two sports. Do you think that competing and practicing in two sports has been beneficial or could specialising in only one sport have brought more success? I always say that I am lucky to have these two sports and that each sport compliments the other. In shooting, you focus on the flight target and the view and you learn to see everything around you. This approach has helped me a lot with rally driving because when I drive I am able to see every stone in front of me. On the other hand, rally driving has helped me a lot with shooting because it has taught me how to fight and concentrate for a long period of time. Remember that I drive for 14 to 15 hours per day and in each moment I am competitive and never I give up and this is the same for shooting. The difference between shooting and driving is that in shooting you must always be psychologically stable and keep the adrenalin under control; you must remain very calm. You must be committed to and focussed on a single target. Driving is different. Your mind must be very focused inside the car, but you must be very active and dynamic, with fast reactions. You have to do everything together: steering, changing gears, breaking, clutch, accelerating and all in less than a second. The brain must work very hard. Even using the switches, the windscreen wipers, you do it all with the same speed. How did you feel after winning your Olympic Bronze Medal? I have always dreamt about the Olympic Games because a medal from the Olympics is completely different to other awards. I have won the Dakar Rally, the World Rally Championship twice, Middle Eastern Championship seven times and a lot of other races, but the feeling was completely different when I won the bronze medal. I felt so proud that I represented my people and those who support me. I felt that the country was behind me. Rally driving is supported mostly by the companies and only a little by your country but in the Olympic Games it’s all about your country. This is a huge difference and I have not felt it before. After winning my bronze medal I have decided to continue the Olympic dream and reduce the number of rally races next year to give myself more time for shooting and to slowly prepare myself for the next Olympic Games in 2016 in Rio de Janeiro. When it comes to sport, what message do you give to young people? When you see my country and how much effort the Government has put into developing sport, I see how lucky we are in Qatar. We don’t pay anything to play; everything to do with sport is funded by the Government. I tell the kids that I know a lot of people from other countries who are not so lucky and who have to pay to play sports. The young people get everything free and they should appreciate that. For example, in shooting, I use 600 cartridges and 600 targets per day and also have to maintain my gun. This costs around US$1,200 every day and I don’t pay for it. The Federation pays and this is what is different from other countries. When I first got into shooting I paid from my own pocket and I didn’t shoot every shot because it cost me money – I only shot when I could hit the target. Now I see some young shooters who don’t necessarily appreciate the money that it costs to train but I feel it is important that they learn that everything has a price so I always try to explain this to them. We are making progress, but sometimes it is difficult because you see different mentalities. Even if it is now free, I respect what my federation gives me and I try to generate this attitude in young people. I read that you have applied to be a member if International Olympic Committee Athletes’ Commission. What could you bring to this organisation? I would like to be a member of the Athlete’s Commission because I have experienced five Olympic Games and I know what the athletes want. Firstly, I would like to push for better media coverage for certain events. Sometimes when you go to the Olympic Games or other important international events you notice a big gap between sports. For me, it’s important that we balance every sport. The Olympic Games in London were great. There were a lot of spectators and support. Usually it’s difficult to encourage spectators to come to shooting but in London the stands were full – there were no empty seats. I think it’s important to create a better balance so that no one sport is privileged over another. Also, I would like to address the balance within teams that attend the Olympics. I think it’s important to put the athletes first. Some teams bring a huge entourage of administrative personnel that is up to five times larger than the number of athletes. This can lead to the exclusion of medical staff such as physiotherapists. For example, when I went to the Olympic Games, I couldn’t have a pass for my physiotherapist, he had to sit in the hotel. The heart of the Olympics is in the athletes and I think it is important that we don’t lose sight of that. What sports did you play when you were young? I liked running and I used to do marathons at school. I also enjoyed football and gymnastics. I used to do everything, really. The last sport I did was horse show jumping, which I did for 4 or 5 years, but I felt that this wasn’t a sport that would bring me international success. I didn’t want to waste my time, so I put rally driving and shooting together and I started a career in those sports. I wanted success in two sports. Many people said that it is not possible to be good at two different sports, so I said ok, I will try to break this rule and change this idea. What do you think needs to be done in Qatar and other GCC countries to encourage more participation in sports from children? I think we must start in the schools. Do you visit the schools? Yes, I get invited to many schools to visit the kids. I do a lot of things like that now, to show the kids that sport is important. I remember even when I was at school there were many obstacles that stopped us playing sports. When I ask people from Europe about their experience as children they tell me they had many opportunities. We should work to achieve that here. We have a good country that is in a good position, but we have a lot to change and we must help the kids.